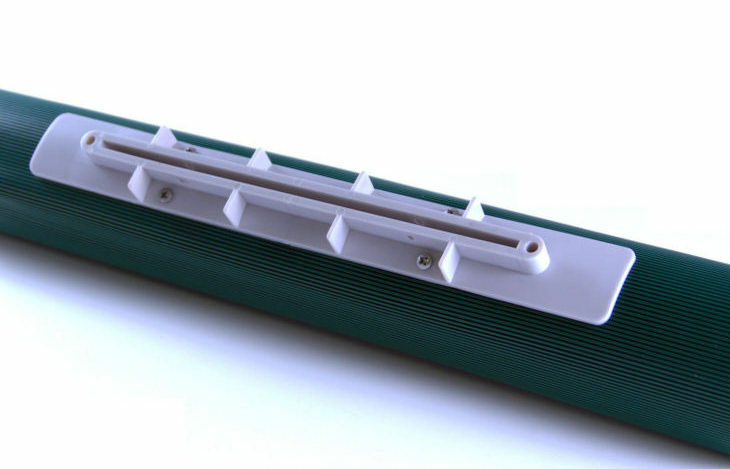 SMART DRAIN� utilizes a revolutionary new approach to drainage. 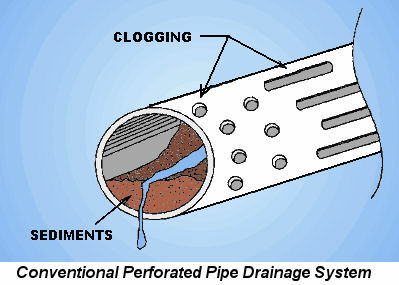 Instead of standing in the way of water (filtration), SMART DRAIN� forms unimpeded columns of water in its micro siphons. Filter based systems like geosynthetic fabrics, stand in the path of water, trying to stop the soil fines, but these fines are what ultimately clog these systems as they build up over time and start to impede flow leading to clogging. The SMART DRAIN� belting is placed with its micro channel inlets facing downward so that particulate matter will not drop into the channels. 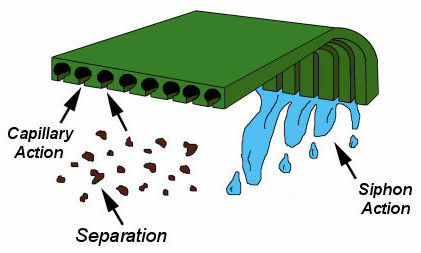 When the micro channels start lifting the water into the cavities, dirt and particles are not lifted with them. Whereas gravity helps to clog traditional perforated pipe, gravity actually helps SMART DRAIN� separate the water from the soil. Solids are held back in the soil by gravity. This is the secret that makes SMART DRAIN� last so long, the separating action extends the working life of the system indefinitely. The second major innovation that SMART DRAIN� utilizes is a siphoning action. Much like a straw the micro channels create a powerful suction force when placed at an angle. The drain belts are inserted into the collection pipes at a downward angle creating the siphoning action along the micro channels. The weight of the water creates negative pressure that speeds the water into the collection pipe and, additionally, helps to pull more water into the system. The higher the angle of descent, the greater the siphoning action becomes. 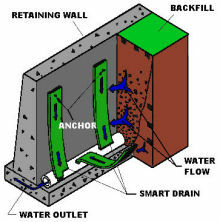 This is proved by fact that vertical SMART DRAIN� installations perform about 3 times faster then horizontal ones. 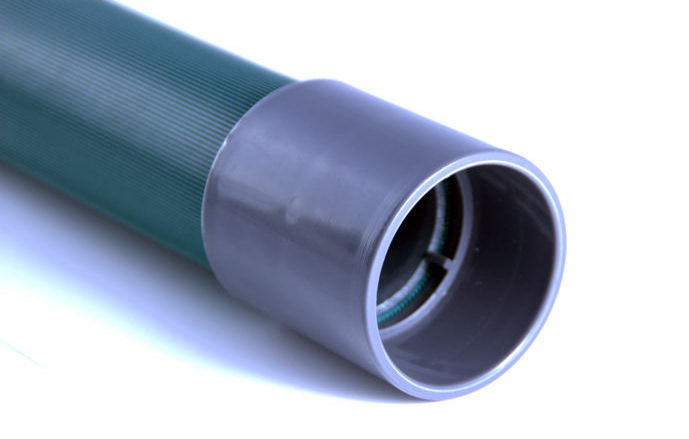 SMART DRAIN� now comes in a round pipe form that can be used with or without SMART DRAIN� belt. 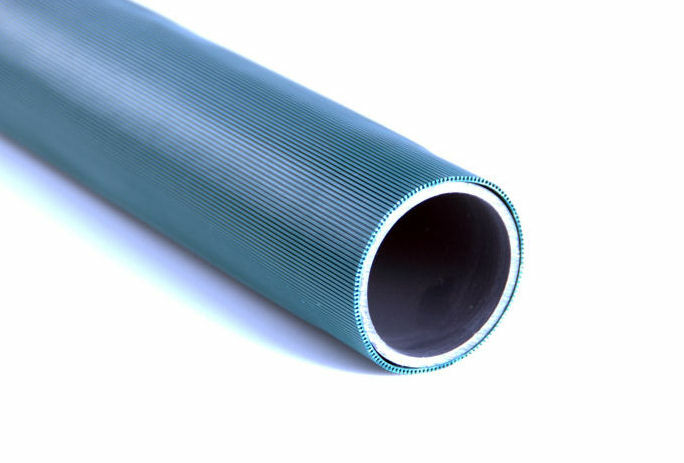 This pipe is perfect for retrofitting existing retaining walls, where excavation would be impossible or costly, and can replace perforated pipe in most subsurface applications and is perfect for commercial and residential foundation drainage. 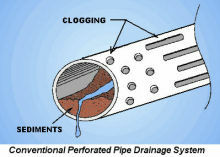 Used in conjunction with the belt, SMART DRAIN� wrapped pipe is the ultimate drainage system. 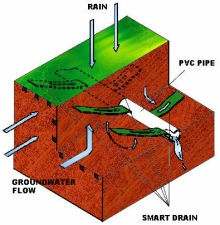 SMART DRAIN� works in any soil. Although some aggregate like coarse sand can improve the performance, SMART DRAIN� doesn't need aggregate to make work, thus reducing the costs of installation. Since it will not need to be replaced due to clogging in a few years, SMART DRAIN� truly becomes the low cost and best option for your drainage needs. This chart shows the efficiency of Smart Drain in sand and clay. The theoretical flow rate is what you would get with gravity drainage. 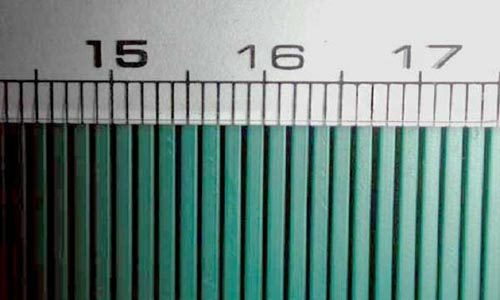 The measured flow rate shows Smart Drain's actual performance in laboratory tests. 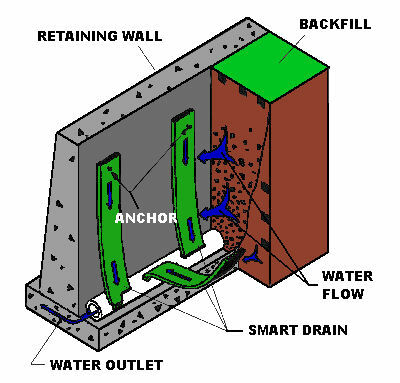 This shows how Smart Drain is faster and more efficient than traditional gravity drainage. 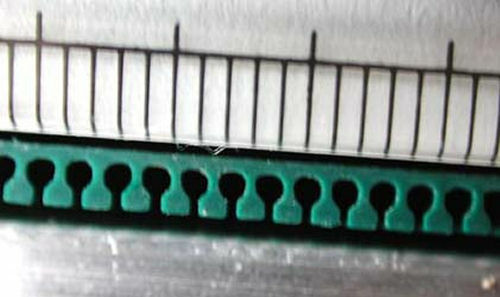 Smart Drain is also very compression resistant. Its low profile design, with the arched support of the micro channels, makes it one of the strongest drainage materials around.